My friend Dennis from high school put out a facebook message that he’s off to Edinburgh to meet his Scottish relatives and take in the preliminaries at the British Open, which this year will be played on the old course at St. Andrews, with the winner taking home a prize of U.S. $7 million. I wished him safe travels and urged him to go to the Campbell’s ancestral home at Inveraray, on the banks of Loch Fyne about 60 miles North of Glasgow, but he said it’s too far off the beaten course this time. Dennis, of course, has a busy itinerary and visiting my clan’s home isn’t a priority. Still it would be nice to know that someone I know went back to take a look at my family’s roots. I’ve never been to Europe, which makes me feel like the complete American bumpkin. But on the 4th of July holiday that certainly doesn’t seem like such a bad thing. In a nostalgic mood, however, I heighed myself to the RedBox at my local grocery story and rented “The Young Victoria,” a costume drama on the courtship and marriage of Queen Victoria. She and Albert had a wonderful marriage and nine kids. One of the queen’s daughters, Princess Louise Caroline Alberta married John Campbell, Duke of Argyll, Marquis of Lorne in 1871, which practically makes us cousins and explains my love of castles, corsets and corupt butlers. It’s in my DNA. If only I had a carriage and footmen! Although the couple spent a good deal of time ruling Canada and chasing the queen around, they did live at beautiful Inveraray (above), where the current Duke and Duchess live today. Chef Matz they tell me was appointed executive chef for Ashford Castle in 2003 and oversees the property’s celebrated George V Room, Cullen’s at the Cottage and the Connaught Room, which is available for private functions – Super Bowl Party here we come! Wahoo! It is at these spaces, they say, that he has created a following of food adventurers who are lured by his creations and ingenuity with local ingredients. Cripes locavores in Ireland. What next? The Loch Ness Monster? Ashford Castle (above), which dates back to 1228 (new by Campbell standards, my family having come to the islands from the continent with William the Conqueror in 1066) is set on 350 acres of County Mayo, on the shores of Lough Corrib and the River Cong, with a backdrop of woodlands, lake, river and mountains. An overnight stay will set you back about at least $175, not including a dinner prepared by Matz. Sorry, no Motel 6 nearby. So, because watching British costume dramas on the 4th of July is about as close to the ancestors as I’m going to get, I’ll wait for Dennis to get back with his travel tales and hope that some of you will sleep in a castle before long, preferably at Inveraray, or Ashford, in a pinch, and then you’ll tell me how it feels. Oh, and when you go don’t forget to tell them Lady Kate of Nutwood sent you. 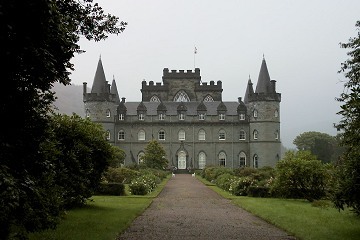 For more information on Inveraray Castle, go to http://www.inveraray-castle.com/. 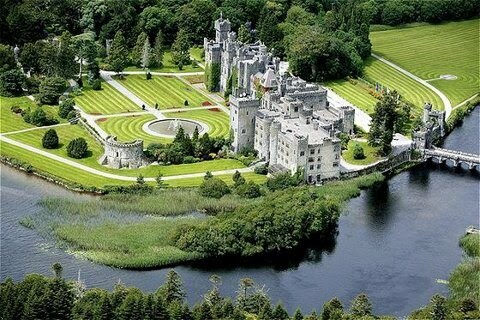 Reservations for a stay at Ashford Castle can be made at http://www.ashford.ie/.